A 1970s office block has been given a new lease of life with enlarged floorplates and four extra steel-framed floors above level 11. 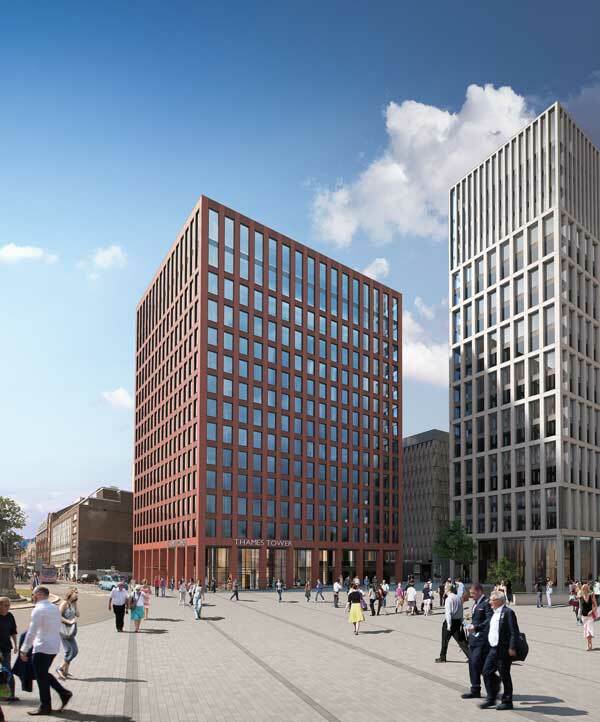 Client: Landid Property Holdings LtdThe project’s original scheme concept was to demolish the existing concrete-framed Thames Tower in Reading town centre and replace it with a new 25-storey high tower, which would have necessitated the requirement for new supporting foundations. However, after an innovative design proposal provided by Peter Brett Associates, the core of the existing structure was maintained and developed using a series of strengthening works throughout the height of the concrete frame, along with the provision of four new additional steel-framed office floors to increase the nett usable internal areas. This proposal also provided huge ‘value-engineering’ savings to the scheme, as the basic core of the structure was maintained and no enhancement of the existing concrete foundations was necessary. Refurbishment work also includes stripping the building right back to its structural frame with the removal of its cladding, which will be replaced with a terracotta system to mirror redbrick buildings in the town. “Steel is ideal for this kind of project as it is quick to erect and lightweight in comparison to other materials,” says Peter Brett Associates Project Engineer Roderick Wilson. 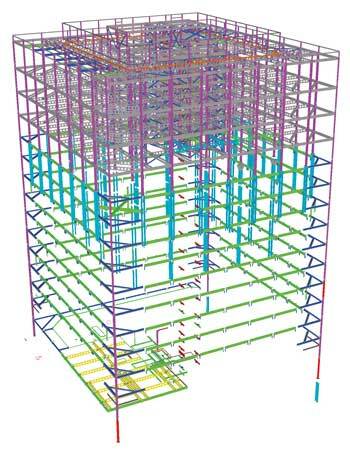 As well as the four additional steel-framed floors, steel construction has also played a role in maximising and extending the existing floors of the tower. The structure’s original design had the perimeter columns protruding beyond the floorplates. For the new design, project steelwork contractor Shipley Structures has installed a series of new perimeter support beams that have been fitted and connected to the existing concrete columns. These beams support new metal decking and a concrete topping, which brings the floors flush to the exterior face of the columns. “The beams have also provided the necessary support to allow the existing concrete perimeter upstand beams at level two up to 11 to be removed,” says Bowmer & Kirkland Senior Project Manager Bill Poole. Altering the four corners of the building has further increased each of the tower’s existing commercial floorplates. Previously the corners featured a 45-degree chamfer, which has now been infilled to create a new perfectly square structure. 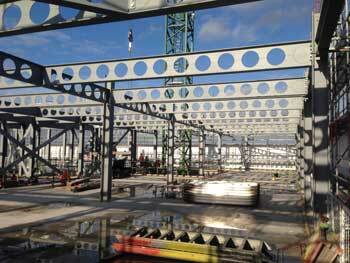 This was achieved by Shipley Structures installing a new steel column in each of the building’s four corners. Two new connecting floor beams were then added at each floor which, in turn, support metal decking that forms the new floor space. This work has increased the tower’s floor space from 13,600m² to approximately 17,000m² of offices and 740m² of restaurant/café space. A 500t-capacity mobile crane was required to install the site’s tower crane. However, due to the poor ground conditions surrounding the site, the chosen spot for this large crane had to be piled and strengthened prior to its arrival. To strengthen the existing columns flat 15mm-thick steel plates were fabricated and installed to two faces of all internal columns from level six up to level ten. 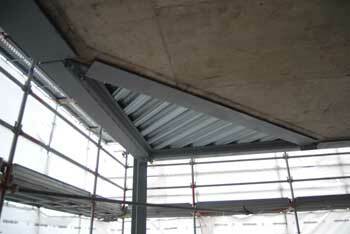 At levels nine and 10 further strengthening plates were also fitted to the perimeter columns. 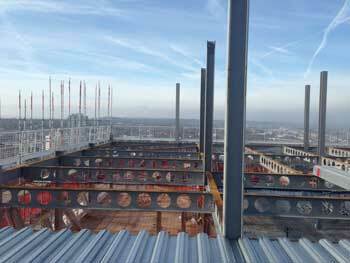 At level 10 additional plates and stiffener brackets were fitted to three internal concrete columns located below the tower crane location. After all of these strengthening plates had been anchored into place they were then sealed and resin bonded to the existing concrete columns. Once the strengthening works had been completed and the tower crane installed, Shipley began the erection of the new steel floors at the top of the tower. The new steelwork connects and is bolted to the existing concrete columns, while in the corners the frame connects to the new steel columns previously erected by Shipley. Predominantly based around a 6.3m × 5.8m internal grid to match existing columns below, each new floor is formed with a series Westok cellular beams that accommodate services and support metal decking. Summing up the judges say, this is a thorough and rigorous project which has been carried out with ingenuity and skill. With both painstaking analysis and inventive thought a substantial, but unloved, city-centre concrete building has been enlarged upwards and horizontally by the creative use of steelwork.